The amount of 10.01 USD has been withdrawn from your account. Accounts: U26xxx->U20095150. Memo: Shopping Cart Payment. L77771744.. Date: 03:51 14.04.19. Batch: 255719317. The amount of 1.49 USD has been deposited to your account. Accounts: U15455554->U26ххх. Memo: API Payment. 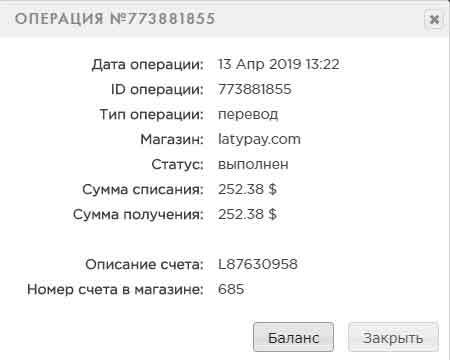 Бонус от вклада по проекту LatyPay от Охотников за Деньгам.. Date: 18:03 14.04.19. Batch: 255800639.